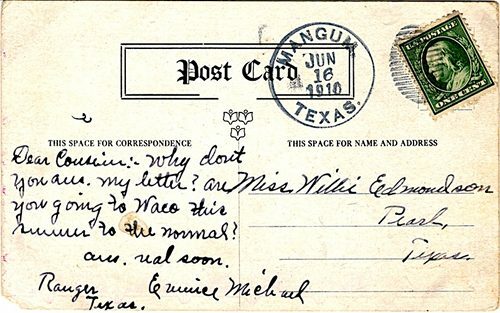 Mangum started in the early 1890s with a great advantage over most Texas towns. While most struggling communities would be happy with one railroad connection, Mangum had two. 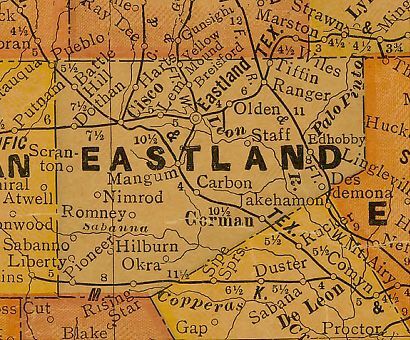 They were the Eastland, Wichita Falls and Gulf (East to West) and the Missouri, Kansas and Texas (north to south) lines. The settlement was named for Robert Mangum and other Mangum family members. "Bob" was the community's first store owner who became postmaster in 1899 when the post office was opened in Mangum's store. Pete Mangum became the depot agent for the Missouri, Kansas and Texas and used his position to ship bottled water to other parts of Texas. Texas was then going through its curative water boom times and Mangum had plenty of examples on how to capitalize on the water. The Mangum Mineral Water Company shipped the bottled product while another man (Dave Switzer) a hospital and bathhouse under the name Maurice Mineral Water Company. Switzer also operated the Don Carlos Hotel to take in the visitors who weren't taking the waters. Although the permanent population of the town was just 150, many found work associated with the town's most plentiful resource - at least until the fad started to fade. Competition was brutal and more advertised spas (like those in Mineral Wells and Marlin) siphoned off business. The Magnum post office closed in 1929 and the Great Depression was Magnum's final blow. It was dropped from maps by the mid-1930s but fifteen hardy people (maybe it's the water) managed to be included on the 2000 census.